EOS Blockchain: Why It's Being Called The "Ethereum Killer"
A few months back, Ethereum has been enjoying its supremacy and monopoly when it came to creating DApps and Smart Contracts on a blockchain. However, as a few projects grown and moved out of the Etherum Mainnet to their Mainnets, it increased the competition for developing DApss and other projects on top of those. Ethereum’ network was facing congestion and scalability issues. Thus, a lot of projects preferred these newer blockchains. One such competitor that is giving stiff competition to Ethereum is EOS. 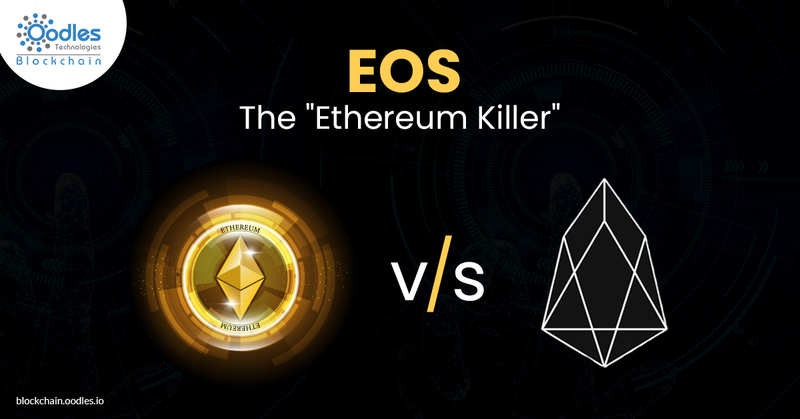 Although when comparing these two, EOS does provide some advanced features and advantages, still there are some places where Ethereum precedes. Ethereum Blockchain is one of the world’s leading network for developing decentralized applications. However, now it seems like that the EOS network is gaining significant traction. As per the report from dappradar.com, approx. 13 decentralized applications have experienced more than 300 users in between 17 to18th September 2018, out of those, seven on EOS and six on Ethereum. Ethereum is a blockchain-backed distributed computing platform. It’s an operating system that bolsters Smart Contract Development Services. It utilizes a decentralized system Turing-complete virtual machine called the EVM (Ethereum Virtual Machine), to allow scripting using a global network of public nodes. Ethereum’s internal pricing method called ‘GAS’ gets used to eliminate spam and disburse funds over the network. Ethereum uses a PoW (Proof-of-Work) consensus algorithm. It has the features of being the first powerhouse in the landscape of Smart Contract Services and decentralized applications (DApps). However, recently, it has been facing criticism for its costly transaction fees in this competitive market. Lack of scalability in low transactions, latency in transaction completion (approx. 6 minutes to confirm transactions), and the minimum percentage of network transactions obtained from applications are some other reasons for its criticism. On the other hand, developers are finding their solutions to all these issues in EOS blockchain, such as scalability. It utilizes a delegated PoS (Proof-of-Stake) protocol. In a nutshell, this protocol works like a system of assigned delegates, and be in charge of validating transactions. Although there are numerous blockchain-based platforms to facilitate DApps, EOS focuses that hampers the blockchain adoption and attempts to fix the issues like speed, flexibility, and scalability. Want to know everything about ‘EOS Blockchain,’ here’s a comprehensive guide for Expert + Beginners. EOS can execute transactions in one second. It has a throughput of up to 6,000 transaction/second. While on the other hand, many time the Etherum network has got jammed as it has maxed out the number of transactions per second limit. EOS is famous for its zero transaction fees. Rather than charging fees, executing a Smart Contract requires you to stake tokens. You immediately receive those token back after the execution. DApp developers can decide whether they want to stake their tokens for their users or if the users need to stake theirs. Ethereum asks for burning ETH (gas) to execute smart contracts. And the amount of gas that needs to be burn depends on the cluttering of the network as well as the how complex is your contract. EOS has a long path to survive and win. If Ethereum fails to improve on its weak points, EOS will likely become the most preferred choice of Ethereum developers, which they could use in developing consumer-grade applications. Although, the long-awaited Constantinople upgrade is expected to be launched soon. It may change a lot of things for Ethereum as well. Meanwhile, we need to wait and watch, as such battles won’t be overnight.